I think they were on their way to see The LEGO Ninjago Movie. If so, good move, Mom. The Breadwinner is not for five-year-olds. (Director Nora Twomey confirms this.) Nor is it a movie about Mary — although the young woman on the poster, her green eyes gazing out from her loosened blue hijab, does remind me of Nativity images I’ve seen in Sunday school lessons and Christmas decorations. But what the heck, I’m going to disagree. Let’s call The Breadwinner a Christmas movie. Clearly, it’s not intended to be a Christmas movie… or even one particularly preoccupied with religious beliefs. This latest Cartoon Saloon tapestry of history, religion, and mythology makes no explicit references to Christianity, introduces no talking animals (you can go see The Star for that… but don’t), and offers its endangered central character no magical advantages — unlike the studio’s last two features. You won’t see a single falling snowflake or hear a song about dreams. This is an Afghanistan story, set within a recent wartime context. Don’t pin your hopes on miracles. And yet — bear with me — The Breadwinner offers us a vision that aligns with the fundamental ideals of Christmas. I’ll explain. Set in Kabul in the early 2000s, before the city was bombed by British and American forces, The Breadwinner is a rare theatrical release that never steps outside of a Muslim perspective on history and culture. Adapted by for the screen by Deborah Ellis and Anita Doron, from Ellis’s own Breadwinner trilogy of young-adult novels, the movie’s authenticity is informed by Ellis’s interviews with women in refugee camps. And yet, the movie fuses history and folk tales with a grace that is becoming the signature of this studio’s productions. But The Breadwinner is the most suspenseful, frightening, and — for me, at least — haunting of Cartoon Saloon’s achievements so far. Why? I’m inclined to credit Twomey, Ellis, Doron, and their creative team for showing remarkable fidelity to real-world details. Here’s that rare animated film — like Watership Down and Grave of the Fireflies — devoted to the idea that realism can be as wondrous and as compelling as fantasy. First — the realism of Parvana herself. Parvana is not Katniss Everdeen. Voiced by Saara Chaudry, she’s a feisty 11-year-old with a temper that can flare up at injustice. She’s eager to take risks with her life to serve her ailing mother Fattema, her older sister Soraya, and her baby brother. But, as we learn in the opening scenes, while she helps her father Nurullah sell wares at the marketplace, very little separates her from the dangerous and hateful men around her. The deck is stacked against her in ways that no Disney princess has ever faced. We can feel Parvana’s peril, and it’s hard to know what to hope for. If any ignorant Jiminy Cricket came along preaching that all she needs to do is wish upon a star, she’d have every right to squash him. Her life is never glamorous — not at the beginning, not in her breathless escapes from the Taliban, and not at the end. I can’t imagine this movie as a musical; it begins in desperate circumstances and it ends there too. Still, Parvana is as compelling for what she does as she is for what she suffers. And when things go wrong, she makes a dangerous decision. You know that familiar adventure-movie convention of seeing the hero don a disguise, hoping to sneak unnoticed through an enemy camp? That’s Parvana’s plight, except that the enemy camp is her everyday reality, and she’s not carrying any weapons, nor is she reliant on any sidekicks to rescue her. Her only hope for surviving this scenario without her father is to dress as a boy and pass unnoticed under the Taliban’s watchful, hateful eyes. It’s her against the world. Second — the realism of Islamic extremism. It’s clear that the crises facing Parvana and her family are not some extraordinary circumstances; they are the heart-sickening realities commonplace to women in Muslim culture when fundamentalists are in power. Nurullah, asking a wrathful young zealot to allow Parvana to help him work, has his request thrown back in his face — which is an astonishing show of disrespect, considering that he is a war veteran who lost his leg fighting for his people against the Russians. Soon afterward Parvana watches her father hauled off to prison, accused of teaching his wife and daughters to read. So, Parvana is left housebound with her mother and sister, starving, the laws forbidding them to appear in public. Her brother, a toddler, is too young to speak or know that he’s the only family member valued by their community as anything other than property. Parvana will have to muster the courage to strike out — against her family’s wishes — and find her father, taking him his walking stick and hoping to bring him back. Third — the realism of Kabul and its Taliban oppressors. Almost photorealistic in its landscapes and cityscapes, the movie’s manifestation of Kabul reveals it as a place crowded with, dominated by, and available only to men. The timeliness of a movie about this living nightmare might give Western viewers pause about voices in their own leadership that seek to silence women who testify of abuse and oppression. More importantly, it might help us see Afghanistan not as a civilization that should be bombed until the sand glows, but as a world of prisons whose prisoners need help. The threat in this movie is doubly alarming in that members of the Taliban are both one-dimensional and realistic: They are not supervillains — they’re real-world religious fanatics whose ignorance manifests in ugly acts of hypocrisy, arrogance, and misogyny. Parvana’s mother will suffer a hard beating before the film is over. Watching, I felt the blows of Taliban violence like gut punches because I could not stand at a safe, skeptical distance from the movie. I was caught by its authenticity. We’re not in the land of Make-Believe anymore, moviegoer. Fourth — the realism of storytelling and its role in guiding heroes. Our green-eyed protagonist is heartened by her father’s folk tales and legends — and they are brought to life in a dazzlingly distinct paper-cutout style. But they stay where they are, bound by imagination. Parvana must ultimately strive to save her family without any assistance from magical cats or faeries — agents that participated in the “real worlds” of Cartoon Saloon’s earlier features. This may unsettle viewers accustomed to the availability of supernatural relief at the movies. Finally — the film’s refusal to perpetuate hero fantasies. The Breadwinner isn’t interested in the reassuring delusion that good guys can, through cleverness and action, save the world by blowing up bad guys. Twomey, Ellis, and Doron model responsible storytelling by rejecting the ugly Western stereotype of a Muslim culture made up of villains, moving on a mission of love for the oppressed rather than zeal the destruction of the oppressor. While the movie does not hold back in depicting the Taliban’s evils, it also shows us that extremism is a disease that destroys the body it governs. The Breadwinner attends, in loving detail, to a quiet traditional family that longs for liberation from tyranny. They are the body that needs saving, not the disease. For all of these good reasons why The Breadwinner’s realism makes it such a distinct and compelling achievement in animation, the film moves me for far more personal reasons. I may not relate to Parvana’s peril and trouble — I have never lived within a misogynistic police state (although the possibility seems increasingly likely, these days). Nevertheless, I feel a deep connection to her story in other ways. Like Parvana, I rely on stories I learned in childhood — Bible stories, fairy tales, and more — for hope and understanding. As the storm of Parvana’s worst fears bears down on her, she draws strength and wisdom from a story her father told her. As America’s resolve to be a nation of “liberty and justice for all” crumbles around us, I find that my best hopes come from the truth that resonates within stories beyond the American frame of reference — stories that foretell the inevitable fall of tyrants, that remind me of God’s promises that the vain and the cruel will fail, that assure me of how the sufferings of this present time are nothing compared to the glory that awaits God’s weary children. But I am drawn more directly to the fact that The Breadwinner is a movie made by women to lift up, speak for, and honor women whose existence is too often ignored by the world outside of their cultural imprisonment. That’s why this film grabs me by the heart and never lets go. While I never had a sister, I’ve been blessed with more influential women in my life than men. My mother taught me to read and write. I flourished in my elementary and middle school classes because my teachers were resourceful, educated women. In high school, my closest friend was a pastor’s daughter and an A-student who was a leader in her church and in our class. In college, several of my closest friends were women who have become leaders in the military, in journalism, and in education. For 21 years I have been married to a woman whose intelligence and artistry constantly inspire me. And — I can’t deny my gradebook — the undergraduate women I teach write A-grade papers more consistently than the men do. So, visiting this day-to-day reality in which women are routinely abused, punished, and treated like animals, I feel sick at heart. I can’t think of a higher compliment to pay this movie than this: It makes me want to pray. It makes me long for the liberation of the countless women I have never seen or known, who are made of the same stuff as those who mean so much to me, but who will never be allowed to read, to walk free, to bless the world with their gifts and voices. 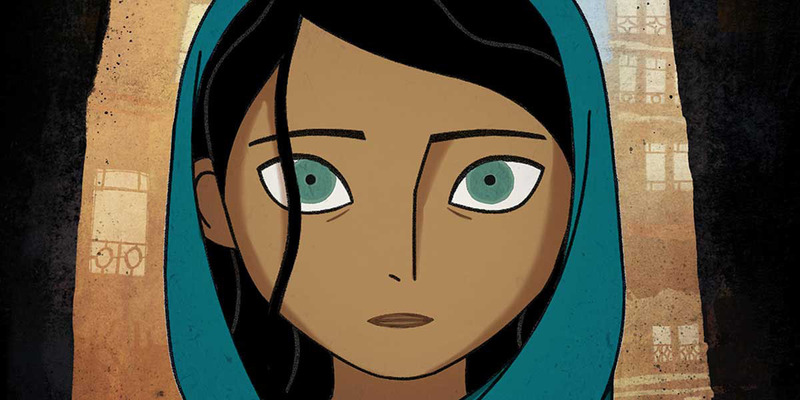 I wish I could say that The Breadwinner concludes with triumph and transformation. Instead, it stands as a lament sung to honor the oppressed. In bringing this story to the big screen, Cartoon Saloon sets a bar for courage, conscience, and conviction that rivals anything produced by Pixar, Laika, or Studio Ghibli. The filmmakers don’t prioritize bedazzlement (although they’re clearly capable of it) — there are no 3D or IMAX versions of this movie. And they don’t give in to the temptation to go for a crowdpleasing, feel-good conclusion. Twomey and company prefer to tell the truth — truth that can burn down walls of ignorance and help disrupt those ongoing cycles of violence and hatred within which we perpetuate the sufferings of so many children of God. So, could we call this movie about Muslims persecuting Muslims… a Christmas movie? I think so. You won’t hear Jesus’ name spoken, but you will sense his call for us to love our neighbors who “beneath life’s crushing load” (as the Christmas carol goes) are “bending low.” Like the Nativity story, here’s another story of a young woman disrespected and hunted, desiring safety for her family, blessed by small acts of mercy, and hunted by predatory male authority figures. Like the Nativity story, this movie calls us to make room for vulnerable refugees and bring hope to neighbors who suffer under tyranny. And, like the Nativity story, The Breadwinner does not conclude neatly with a happily-ever-after, but rather with an affirmation of hope in the midst of ongoing chaos, bloodshed, and trouble. This is the world that breaks God’s heart, that he so loved. The Breadwinner isn’t the Christmas story, but it is a story that reminds us why the world needs Christmas.